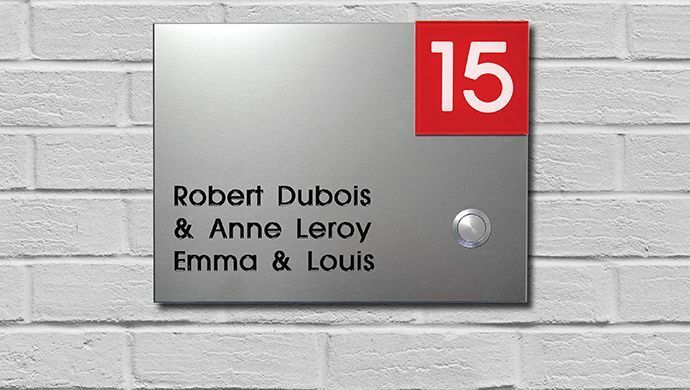 Looking for a door plate to flourish the door entrance of your home or company? An engraved door plate or house sign is not only decoration at your front door, it’s also functional. It allows your guests and/or mail man to easily find your house. Or maybe you need a name plate on your mailbox because you live in an apartment building? Besides standard door plates, MISTER MINIT also makes customized designs in any size possible. We perform engraving on plastic, acrylic glass, aluminum or messing in different sizes and colours. Just give us your text, name, data or logo and we will edit the entire plate with you and show you the final layout for approval! Last but not least, MISTER MINIT engraves also door plates for companies on order. Not only can you provide useful information with it, but it will also add to the professionalism of your business as the material lasts for a long period and requires only little maintenance. Regardless of what information you want to put onto it - a logo, a phone number or the opening hours – our specialists will help you right away.